I’m not a big beef eater, but when I saw this recipe I had to try it! I found it at Campbell’s Kitchen, and it sounded good, quick, and easy. I love mushrooms and the words Mushroom-Smothered sure caught my attention! 🙂 When I do cook with beef, I like to use lean beef that is free of hormones and antibiotics. This recipe is all made in a skillet, so no baking is involved. 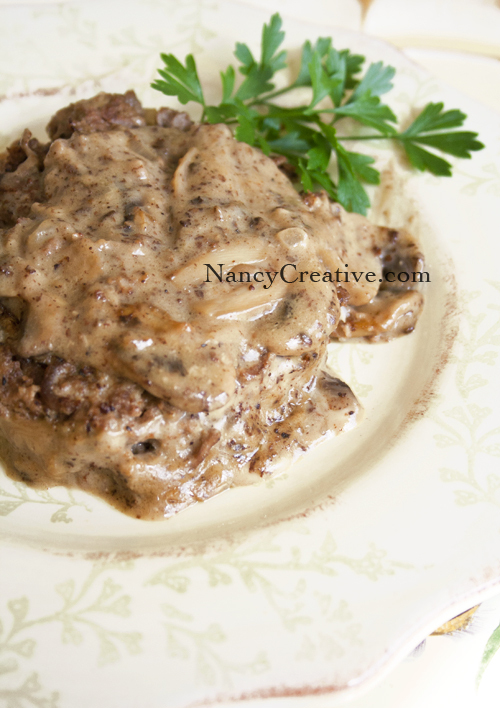 With the creamy mushroom gravy, the taste of these burgers remind me of meatballs stroganoff. You definitely need to use a large skillet, because these are big burgers! The recipe says to use a 10″ skillet, but if you have a 12″ size, I’d use that–my burgers were pretty crowded in the 10″ skillet (maybe it’s because I used very lean beef and they didn’t shrink as much when cooking). Also, be sure to use a non-stick skillet because, with the add-ins, the burgers will stick badly to a regular skillet (I learned this from experience! 🙂 ). I added extra onion, used olive oil instead of vegetable oil, and used a little less water in the gravy mixture so my gravy would be a little thicker. It’s a good recipe to keep in mind when you need to make a simple, tasty dinner! Thoroughly mix 1/4 cup of the soup, beef, bread crumbs, Italian Seasoning, onion, and egg in a large bowl. Season with black pepper. Shape the beef mixture firmly into 4 (1/2-inch thick) burgers. Heat a 10-inch nonstick skillet over medium-high heat. Add the burgers and cook until well-browned on both sides. Remove burgers from skillet. Reduce heat to medium and heat the oil in the skillet. Add mushrooms and cook for 2 minutes or until tender, stirring occasionally. Stir the remaining soup, Worcestershire sauce, and water in the skillet and heat to a boil. Return the burgers to the skillet. Reduce heat to low. Cover and cook for 10 minutes or until burgers are cooked through. Spoon mushroom mixture over burgers before serving. Easy dinner recipes like this sure come in handy! What’s your favorite quick and easy way of serving beef? This entry was posted in Food and Recipes, Main Dishes and tagged Beef, Burger, Cream of Mushroom Soup, Mushroom, Worcestershire Sauce on October 1, 2013 by nancyc. Let me know how you like it with the ground chicken or turkey if you try it! I love most of your recipes. Don’t like to use canned anything…especially soups because of the high salt content! This dish is some real comfort food. I feel better just reading the recipe. Glad you found the recipe comforting! 🙂 It’s definitely a comfort food dish!